In our commitment to help you find products that can actually work for your skin type, we’ve come up with this list of the best face washes for sensitive skin after more than 20 hours of intense work. The products that made it to this list were selected based on their ability to cleanse the skin without over drying it, extra hydrating properties and value for money. Soap-free, Olay Gentle Clean Foaming Cleanser is a good choice for people struggling with sensitive skin. It's dermatologist tested, too. Taking an all-natural approach to cleansing sensitive skin, PriMiracle Professional All Natural Deep Facial Cleanser contains rose hip seed oil to give your skin antioxidants, vitamins and nutrients. It's free from any harsh chemicals that can do more harm to your skin than good. Containing orange oil, SkinCeuticals Gentle Mild Cream Cleanser for Sensitive Skin takes cleansing to a whole new level. It has a lotion-like texture that doesn't foam up as much as the other products. It is, however, effective and gentle enough to use on sensitive and traumatized skin. For a soap-free face wash, L'Oreal Paris Go 360 Clean, Deep Facial Cleanser for Sensitive Skin is highly recommended. It comes with a unique scrubber to help you gently yet effectively cleanse your skin from impurities. If you are looking for a face wash that can cleanse your skin without causing sensitivity reactions, Olay Gentle Clean Foaming Cleanser is a good choice. For one, it’s soap-free. Apart from that, the product is also dermatologist tested. It’s water-soluble and can remove makeup. In case you noticed, the cleanser is actually an old product from Olay that underwent a name change and a slight reformulation. With the omission of some ingredients, it may take some effort before you can create a nice foam with this one. Despite this change, it still has the same effectiveness. In fact, the product is one of the best drugstore face washes for sensitive skin you can find today. For its price, it’s a good deal, too. It has no scent which I find really nice. It will leave your skin feeling soft and refreshed after rinsing. For a natural approach on cleansing sensitive skin, PriMiracle Professional All Natural Deep Facial Cleanser is a good choice. Instead of chemicals and highly irritating ingredients, this one is packed with a high level of fatty acids, vitamins and nutrients- all because of its rosehip seed oil content. It also has vitamins A and C to soothe itchy skin and decrease the appearance of your scars and fine lines. And the best part is that it’s free from sulfates, parabens and other harsh chemicals. The cleanser has a gel-like consistency that lathers up nicely and goes on smoothly. It rinses easily, too. Packed with skin conditioning ingredients and emollients, SkinCeuticals Gentle Mild Cream Cleanser for Sensitive Skin perfectly fits your delicate skin. It can remove excess impurities without causing any sensitivity reactions. It’s safe enough to use even on traumatized skin. The product may take some time to get used to, especially if you’ve been using foaming cleansers for quite a while. Compared with the other brands, this one doesn’t produce as much suds as you’d expect. It is, however, creamy and rinses off easily. The product is comes with a citrus scent- thanks to its orange oil. Although intimidating, it actually works to soothe sensitive and irritated skin. L'Oreal Paris Go 360 Clean, Deep Facial Cleanser for Sensitive Skin is soap-free, which is exactly what you need for your delicate skin. Despite the gentle formulation, this face wash can get the job done. In fact, it can remove more than just dirt; it can also get rid of makeup residues your remover might have missed. The cleanser comes with a built-in scrub. Yes, it’s built-in and it fits perfectly in the middle of the bottle. You won’t lose it in the shower and it won’t take extra space when you’re travelling. Partnered with the face wash, it can cleanse your skin without over drying or leaving it taut. The face wash has the consistency of a thick white lotion. It’s very creamy and produces mild lather. A little goes a long way, so you can expect one bottle to last for two or three months. 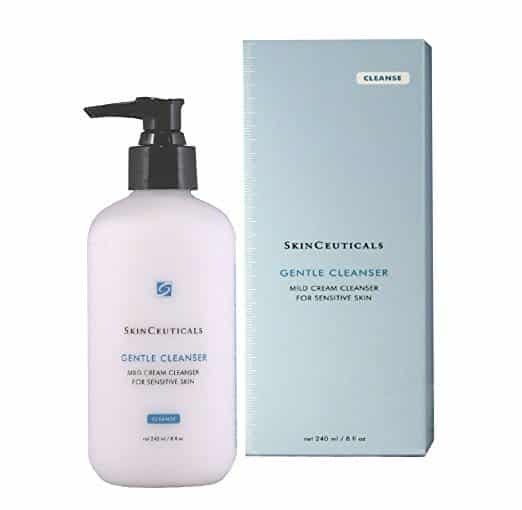 Coming in an easy-to-use pump bottle, Clean & Clear Essentials Foaming Facial Cleanser Sensitive Skin has an oil-free and water-soluble formulation your skin will love. It can remove dirt and makeup effectively. One test I’d like to do to gauge a cleanser’s cleansing property is to use a toner right after washing. If you still see makeup residues on your cotton pad, then your cleanser isn’t that thorough in removing dirt or makeup residues. It is mildly scented, but it’s not that bothering, especially since the cleanser washes off easily. The fragrance isn’t that strong to irritate your skin or your nose. Apart from that, the cleanser isn’t that painful on the eyes, too. The reason why your existing skincare routine isn’t doing any help is probably because you’re not targeting the right skin type. It’s easy to say that you have sensitive skin, but did you know that there are several types of skin sensitivity? It’s a skin condition where your blood vessels swell even with the slightest irritation. Apart from these signs, rosace can also be accompanied by thickening of the skin and some eye issues. It can appear more prominent on your nose and cheek areas, but it can also spread to your chest and back. Flaky and cracked skin are signs that you have eczema. This often results from a faulty skin barrier that lets water escape easier. Apart from water loss, this also make it easier from harmful chemicals to penetrate your skin’s deeper layers. Exposure to smoke and fragrances can easily trigger eczema flare-ups. Dry skin can mean insufficient moisture, too. Some products, especially soap, can strip the skin off of its natural oils, which results in cracking. It can be painful. At certain times, the lack of moisture can also cause your skin to bleed. If, after using a product, you notice red, tiny bumps on your skin, it’s an allergic reaction. If left unaddressed, it can progress to a series of reactions that can include flaking, turning into a leathery texture and itching. It’s best if you can seek the help of your dermatologist for this case since medications may be required to tone down the reaction. Aside from seeking professional help, make sure to stop using any product you’ve recently added to your routine. It may take a while before such reactions subside so it’s recommended that you avoid adding new items, too. Sensitive skin is vulnerable skin. Any strong chemical or potential irritant can trigger reactions that are both uncomfortable and visually unappealing. To keep your skin safe, it’s best if you can limit the number of products you are using. On a daily basis, your skin gets exposed to a lot of potential triggers and using skin care items that are irritating just adds more damage. In cleansing sensitive skin, you should start off with the gentlest cleanser you can find. Although achieving a squeaky clean result after washing is a great feeling, it’s not that ideal for your skin type. You should aim for balance, instead. Your skin should have enough chance to build a strong barrier while keeping it free from dirt and bacteria. Cleanse your skin twice a day, preferably in the morning and at night. Applying moisturizers after washing is extremely important. Since sensitive skin can easily get irritated once its natural barrier has been compromised, you shouldn’t miss following up your cleansing routine with a quality moisturizer. Sensitive skin can give you a lot more problem than you can possibly think of, especially if it isn’t treated the way it’s supposed to be. There’s itching, redness and, in some cases, pain. If these things make you cringe, it’s a good idea to start changing or improving your existing skincare routine. You can start off with our best face wash for sensitive skin, which is Olay Gentle Clean Foaming Cleanser. It’s soap-free, dermatologist-tested and budget-friendly. It does a good job in cleansing the skin without causing sensitivity reactions. The Best 10 Acne Body Washes of 2019: Which Is Really Effective?